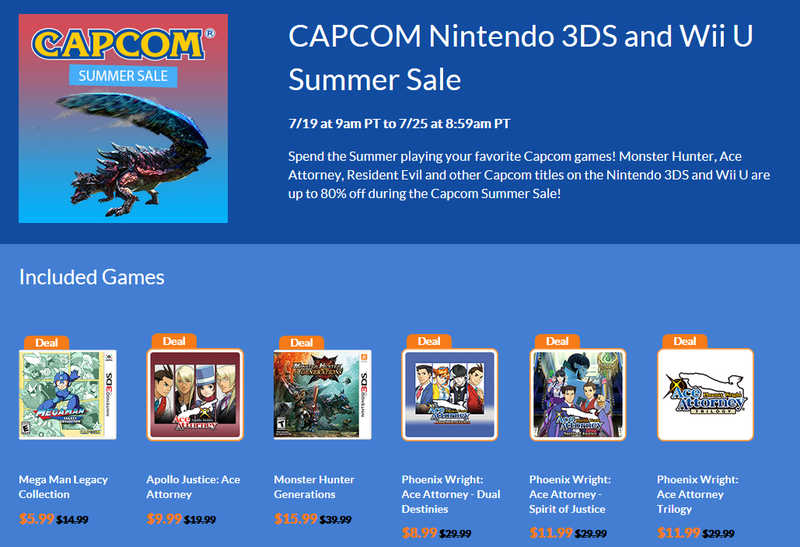 KoopaTV: CAPCOM Summer Sale 2018 — Ace Attorney, too! By LUDWIG VON KOOPA - I'm actually jealous that you can get the entire Ace Attorney franchise at this low a price. Just days later, a whopping FOUR Ace Attorney titles are discounted past their natural bargain prices, because for a limited time only (less than one week), it's the CAPCOM Summer Sale, 2018! Apollo Justice: Ace Attorney was last on sale for 50% off after E3 2018, which is the same discount as right now — 50% makes it $9.99. So if you didn't take advantage of that discount from one month ago, then now's another chance. Phoenix Wright: Ace Attorney – Dual Destinies is now at a record discount. It's $8.99. That represents a 70% discount. Prior to this, the repeatedly-tied record was 66.67% off when it was priced at $9.99. Phoenix Wright: Ace Attorney – Spirit of Justice is priced at $11.99, making it 60% off. The last time it was on sale, in March 2018, it was only 50% off. 60% off marks a new record discount for Phoenix Wright: Ace Attorney – Spirit of Justice! Additionally, Phoenix Wright: Ace Attorney Trilogy has the same discount — 60% off, making it $11.99. Like Spirit of Justice, its prior record was only 50% off. Every Ace Attorney game here is at an all-time record discount, or tied for it, from 50% off to 70% off. These cover the entire mainline franchise — all six of them. You can buy all six for $43, which happened to be the exact same price of the Ace Attorney anime part 1 of season 1 DVD/Blu-Ray box during Prime Day. Buying the entire series on the 3DS for the same price as the anime... that only covers a significant fraction of one game. Oh, and really fun. The Ace Attorney franchise is the foundation for this website. Our truth and levity motto comes from that. It's one of the best franchises ever made. Fantastic story, characters, music, all that. If you don't believe me, then try out any of the number of free demos on the 3DS eShop. It exudes charm, and it's such an amazing value. KoopaTV wouldn't dedicate articles to whenever the Ace Attorney series gets any kind of sale or discount if KoopaTV didn't believe that the franchise deserves it. Only Ace Attorney gets this kind of treatment from KoopaTV, so you better believe that means something. If, for whatever reason, you have trouble funding the purchase of heavily-discounted eShop games, then perhaps the KoopaTV Loyalty Rewards Program, which gives away free eShop card codes in exchange for your participation on the website, will strike your fancy. The next CAPCOM sale is just on the four Ace Attorney games in October 2018, with identical discounts to this summer sale. That price is an absolute steal for all six mainline entries. If I had not already bought all of them, I would get a $50 eShop card and download the series while the sale lasts. It's been a while now since Spirit of Justice released, so it should be any time now before the next game arrives hopefully on the Switch. Right, that's why I said I'm jealous. We're gonna pay some attention to the Tokyo Game Show in September — we suspect an announcement there.